Journaling is the simple practice of writing down your thoughts, feelings, goals, and emotions into a notebook or journal. There are a wide range of benefits, from helping with stress and anxiety, to organizing your life and helping with physical health. To get started, you need a few supplies. For starters, you need to find a journal that works for you. There is no reason you need a fancy, expensive journal, unless you feel that would motivate you to write in it often. This will come down to your budget and your personal needs. If you are starting a bullet journal, you need a larger notebook with no lines on the pages. Even a sketchbook works great for bullet journals. On the other hand, if you want it to fit in your purse, you obviously want a smaller notebook. Look around and take your time when choosing the right journal. Once you have your journal, you then need to choose what to write with. This is another area where using something you love to write with makes all the difference. This can be a ballpoint pen, marker, pencil, or anything else. Try some different writing utensils until you are happy with your choice and know you will love writing with it. Some people like to turn pages of their journal into artwork with sketches, or organize pages with things like stickers and stencils. Go for it! Head to the craft store and stock up on anything you want to embellish the journaling pages with. Once you have all the supplies for journaling, you will then decide on the type of journal and what you want to write about. Remember this is your journal, so you don’t have to do what others are doing. The point is that it is something that helps your life, mental health, stress, and any other reason you want to journal. Once you find what you want to write about, it becomes part of your routine and you don’t even think twice about it. In fact, don’t be surprised if you are suddenly looking forward t the daily journaling routine. If you want to start a journal today, don’t stress about spending money. Find blank pieces of paper or a simple notebook and write in it, then get a new journal when you are able to. For specific supply recommendations, check out this post: Best Supplies for Bullet Journaling in 2019. 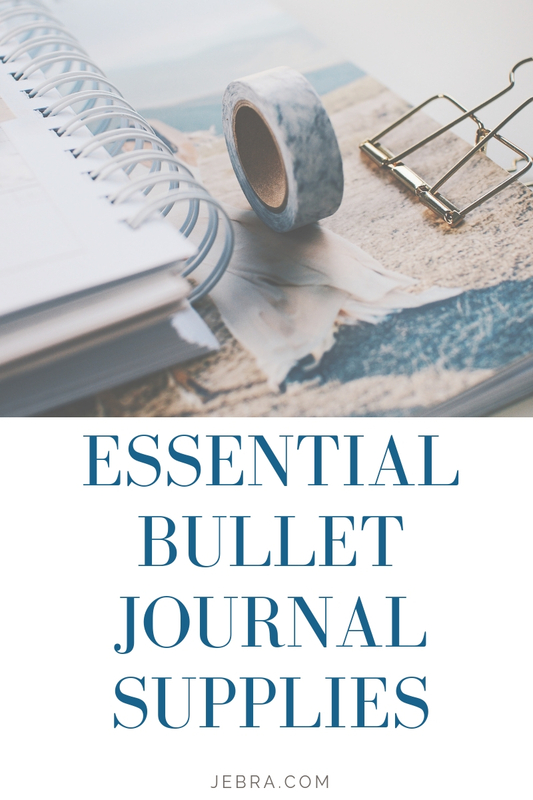 Pin “Bullet Journal Supplies for Beginners” for later!